Bengaluru FC have signed midfielder Alwyn George on a one-year deal with the club having the option of extending it by a year, the Blues announced on Wednesday. Ashley Westwood, in his pre-season press conference on Monday, had mentioned about the possibility of filling in three to four slots on the team for the new season and George’s signing marks the beginning of the process. Having caught Westwood’s eye the moment the gaffer saw him train with the national team, George was always on the Blues’ radar. “We’re delighted to have Alwyn on the team. He is the first Indian player who had my attention simply because of the potential and natural ability he put on display. A lot more was expected of him but, for whatever the reasons be, he hasn’t been able to do justice to his potential. He’s certainly a player who we can improve and get him back to his best. I see this signing as an asset to the team,” said Westwood of his latest acquisition. 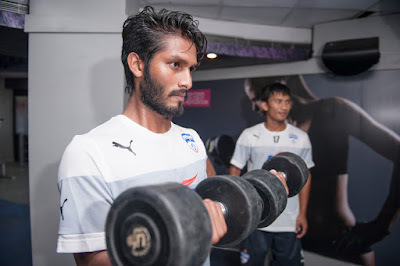 George was part of the Dempo squad over the last two seasons but struggled to get adequate playing time which even saw him lose his spot in the national team. But the talented youngster believes his stint at BFC will be the perfect springboard he needs. “I am really excited to have signed for Bengaluru FC. No one comes close to them when it comes to running things professionally and I am glad I will get to experience that first-hand. The last couple of years haven’t been my best but I now want to prove that I can force my way into the starting XI of any team,” said George on completing his signing. George’s first day at training included a session at the gym with the team.